After I ate the Mediterranean Baked Fish at The Manhattan Fish Market the other day, I wanted to try baking it myself at home. Surfing through the Net, I found this recipe. Original post can be found here. 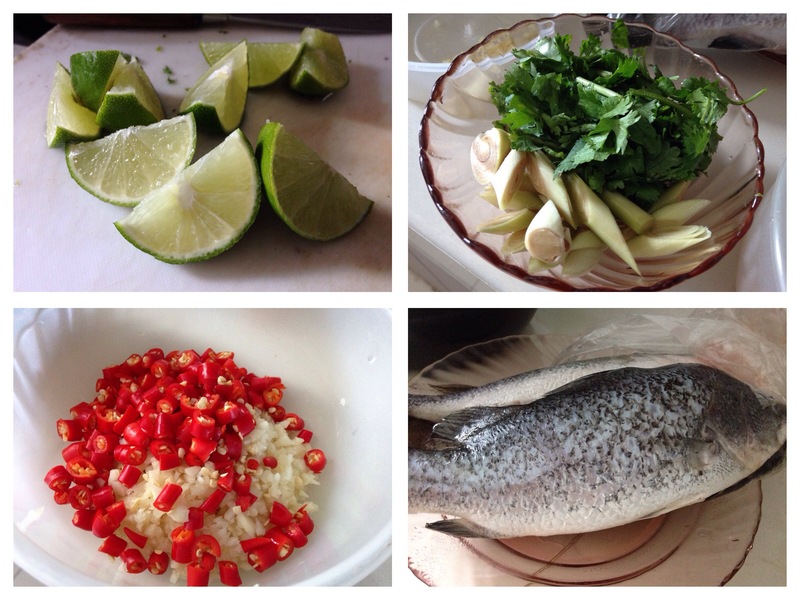 My Mediterranean Baked Fish … Yumss!!! Marinate the fish with all the ingredients and wrap in the aluminium foil. My Spicy Salmon with Pineapple and Mango Salsa …. Yumss!!! I’ve already posted the Pineapple and Mango Salsa recipe earlier, so today will be sharing the recipe for the Spicy Salmon…. I called it Spicy cos it is really spicy with the addition of the birds-eye chillies. Salmons are expensive and so this is the first time I’ve ever bought them and cooked them. This recipe taste good especially when you eat the salmon with the salsa. Quick and easy to cook too! Before baking them in the oven …. Place salmons in a casserole dish lined with aluminium foil. Drizzle both sides of the salmon with lemon juice. Combine the spices and sprinkle both sides of the salmons with the spices generously. Then add the lemongrass, onions, birds-eye chillies and over them. Last, add the butter on top of the salmons. Baked for about 12-15 mins in the oven over 200 degree C.
One of my favourite recipe and this dish has always been a winner in my family. 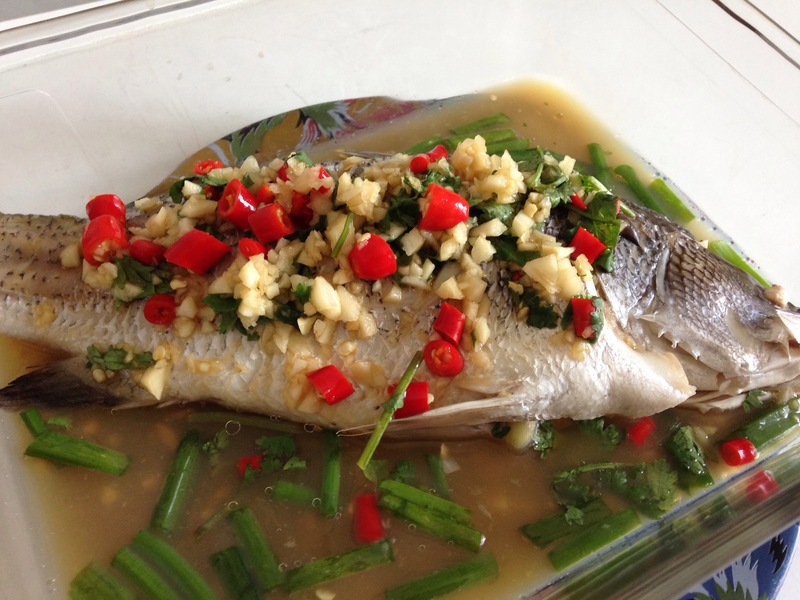 The Malay style of bbq fish has two version. One is to just bbq the fish and then dip into a spicy sweet black soya sauce (sambal kicap) and another is to bbq the fish with a very spicy sambal (chillies mix) on top. This recipe is the 2nd version. If you are using stingray, let the stingray soak in tamarind water for about 1/2 an hour. Then wash clean. Best to scrap the skin lightly with the back of the knife, this helps to get rid of the strong fishy smell. After that, steam the fish for about 10 mins. Steaming the fish first will help to lessen the time during the bbq. Next, take a piece of the banana leaves, spread 1 tbsp of the sambal (chillies mix that has been cook as instructed below). Put the fish on top of the spreaded sambal, then add 2-3 more tbsp of the sambal on top of the fish. Wrap the fish with the banana leaves neatly. Use toothpicks to close the leaves. BBQ the fist for about 10-15 mins. Take a small wok, pour oil and then fry the blended ingredients till fragrant. Add sugar and salt and a bit of water. Let it simmer for about 20 mins or till it thickens. Ok what’s not to like about sardines right? It can be cooked or even just ate it right off the can. Last night, after work, called my girls to cook the rice and upon reaching home, quickly get the troop to help me prepare this dish, Sardines ala Tom Yam as I called it. 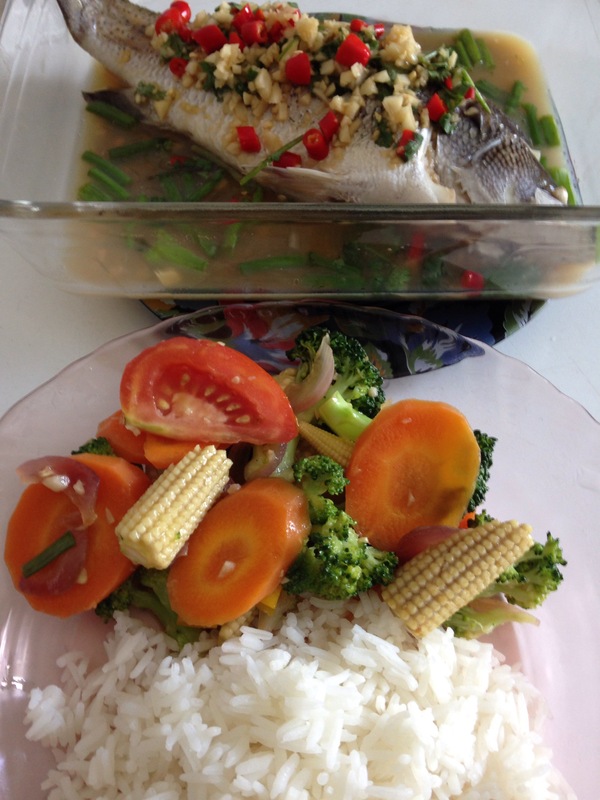 Its easy to cook and taste good to my palate hahahaa…. cos I like spicy foods and it does taste similar to Tom Yam soup. I opened two cans of sardines, wash off the sauce, dried them and fried them for about 2 mins on each side with a little oil. Drained them and put aside. Then, my eldest girl, chopped 4 birds eye chillies, 2 green chillies, 1 big onions (cut into four), 1 lemongrass, 2 kaffir lime leaves. Boil water in a medium size pot. Add the ingredients above. Then add in a bit of lime juice (about 2 tbsp), add the sardines and salt to taste. Let it simmer for a while and then off the fire. Ready to be eaten with rice. Yumsss!!!! I cooked this a few days ago, been to busy to upload and only this morning I finally am able to. Fish in fermented soya bean gravy. You need 2 onions (slice), 1 grean and 1 red chillies (slice), 1 stalk of lemongrass (crushed lightly), 2 garlic (slice). All these fry till fragrant in a wok or pot. 1 bottle of fermented soya beans …. must wash it thoroughly if not will be too salty. So when cooking this dish, do not add salt until you have tasted it. Usually when I cooked this, I do not need to add any salt at all. After the onions, chillies etc are fragrant, add the fermented soya beans and stir for a few minutes before add half a cup of tamarind juice or more (up to your preference if you want more gravy or not) to the wok or pot. You can use half a cup of tamarind juice and then if want more gravy just add water to it. Leave them to simmer for a while, then add the fishes. Let it boil for another few minutes and its ready to serve hot with rice. 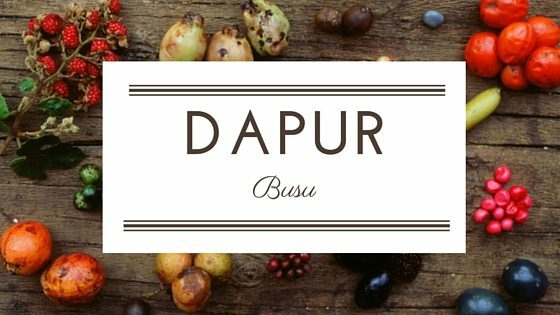 Sharing Peri’s Spice Ladle entry …. the moment I read the recipe I was really tempted to try it. Definitely gonna try one of these days once all the ingredients are available to me. It looks delicious and simple to make. Thanks Peri for the sharing. Ok yesterday I mentioned about “siakap 3 rasa” similar to sweet n sour actually but more spicier. We use Seabass cos the flesh are tender and sweet. Can also use other type of fish. These are ingredients to cook the sauce …. 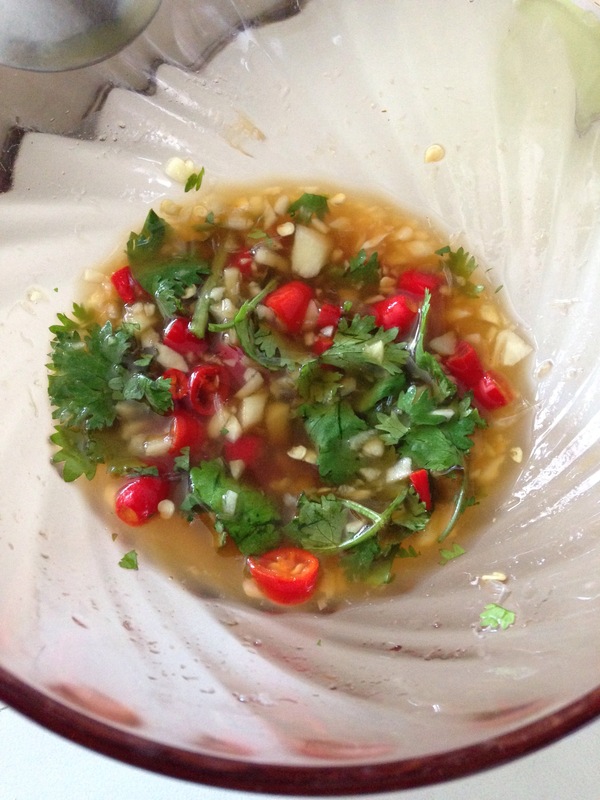 garlics, onions, tomatoes, birds-eye chilies, kaffir lime leaves, tomato ketchup and chili sos…. oh and 1 lemongrass (sorry it was not in the pic). Fry with a little oil the garlics, onions, kaffir lime leaves …. once fragrant, add a little water, stir and add the balance of the ingredients. Add the ketchup and chili sos … more chili sos than ketchup … have to use your estimation cos that’s how we cook it, sorry no measurement (kita masak main campak2 jer …). If the sauce is watery, just need to add corn flour mix to it and cook it till it thickens. Add salt and sugar to taste. Deep-fry the seabass and set it aside on a plate and pour the sos over the fish.